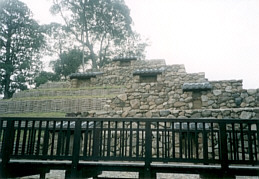 Layer pyramid or Borobdour-like Buddhist monument(AD 767) is among houses in Nara-city, Japan. Banal residential quarter TAKAHATA: southern area of old city Nara, has this strange Buddhist pyramid. This construction comprises soil and rocks. 24m x 24m in base and about 12m high. I describe recent condition (AD 1999). Main 3 layers(2-3m high), low layers(about 1m) between them, and a top layer(about 1m). 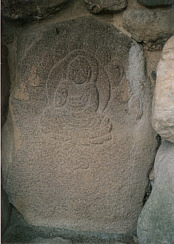 Each face of main 1st and 2nd layers has 3 niches, each of which holds one relief rock of Buddha (about 1m20cm high). Each face of 3rd layer has 2. Each face of Top layer has 1. Shape of relief rock is various and may be natural rock one face of which was polished. All reliefs I saw are granite, but ref.1 records a few are slate. This style is unique among countless Japanese Buddhist architectures. Many Japanese feel it exotic and alien. I'm reminded of Borobdur in Java and Maya temple pyramids in Mexico/Guatemala. "Soil in core and Rocks in mantle" method is found in Ankor-Wat and other south-eastern Asia Ruins. What do western people think about THIS? Comparing stupa (Tower tomb of Buddha relics) in India and central Asia, scholars (ref.1. and others) think this a stupa for worship. In Japan , stupa was generally constructed with wood on Chinese architecture style in ancient period. This is an exceptional example. Old document (11th cent.) says " 13 layers tower". Ref.1 thinks this "13 layers" are ornamental umbrella constructions generally found on stupa in India (Sanchi, etc). This suggests old shape of this tower, which is more similar to the Indian one. These Buddhist Reliefs are masterpieces through Japanese rock arts. Ref. 1 says "Where can we find such beautiful relief excluding some in Kyon-Jyu, Korea". They are Flat Reliefs (Stiacciati Rilievi, following Giorgio Vasari) on granite block (height about 1m). Some are lost, some are worn off. Until 1972, 13 reliefs were recorded(ref.2 contains all monochrome pictures). 8 are triad or Buddha paradises. Others are one Buddha images, Buddha and devotees, and Nirbana scene. Recent excavation found several new reliefs. Fig. 5, Fig.6 is not recorded in ref. 1 and ref.2. 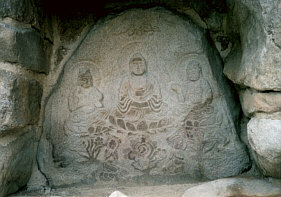 Fig.3 is regarded as "Yakushi-Buddha Paradise" in the east face of 1sy layer. Two small devotees in the low part are re-birthed ones in this paradise. 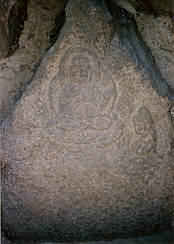 Fig 4. may be"Amidaba-Buddha Paradise" in north side of 2nd layer. The style is refined, intimate, familiar, and modest. Neither threatening, exaggerate, esoteric, nor powerful. They attract and lead me to simple worship and meditation. Composition of the Buddha triad likes this Tang dynasty relief, which was patronized by Tang Court ( about A.D. 700-750.) One of the set(over 19) in Tokyo National Museum. It was originally in a temple in Si-an( Tang empire capitol). But, it is more rigorous than this Japanese reliefs. This Nirvana scene in this tower is incised, which was recorded in books (I haven't seen real rock. ) (Rubbing Plate. Source ref.1). 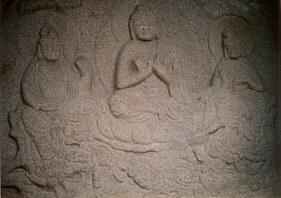 It shows the scene that Buddha died in Kusinala. It has been obscured for 1200 years, but recognisable. It doesn't draw Buddha on the bed. 4 monks and a lady lament around an empty bed. This style is common in early Buddhist arts in India. Artists and devotees omitted the figure of Buddha himself, because he is too saint to be drawn. The ancient Indian style surprisingly appears in this far eastern corner. Old document of To-dai-ji temples shows. In AD 767, Priest "Ji-cchyu" built a tower south of the capitol(Nara-city) for Nation. Scholars think it is this tower. Old legend says, this tower is a tomb of head/scull of great priest"Gen-Boh". who was exiled and died in distant province. This legend was sometimes recorded from 12th century. On this legend this stupa has been called "Zu-Toh" i.e. "HEAD TOWER". This legend should become wrong, now. In 1970s, it was a hill with a lot of trees and bushes. Among bushes, one could see some reliefs. Recently, this ruin was excavated, cleaned, and repaired. New tile roof was added to protect the reliefs. Maybe some additional rocks to support the construction. But southern face has not been cleaned and can not be accessible. Before cleaning, from southern face scholars can access. Oppositely, now, we can't access the southern faces. We can see new discovered reliefs, but not old well known ones. This is on preparing at Sep.1999. Now it is fenced. Visitors can borrow the key in neighbor house.